The first time I ate garlic flowers was for breakfast on a train from Beijing to Ulan Bator, Mongolia. The dining car didn't have a menu. You sat down and they brought you food. I went there as soon as the train left the station, and was happy to find it open. A server delivered a plate of stir-fried chopped green things with pork and oyster sauce, and a bowl of rice. 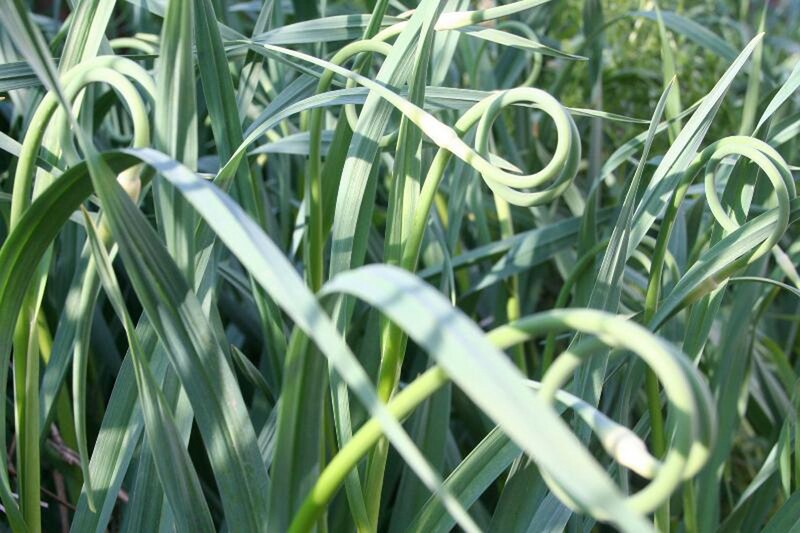 It was years later that I realized that the pencil-thick green things were pieces of garlic flowers and flower stalks, which are collectively known as scapes. They were at once spice and vegetable, and a perfect companion to the pork and oyster sauce. If the servers hadn't moved me along I could have sat there for hours, watching workers doing Tai Chi in front of factory after factory, and eating pork and scapes until I exploded. Garlic flowers are a byproduct of the crop's cultivation, and some growers see them as more nuisance than bonus, because they have to be removed, which takes work. Picking garlic flowers is based on the same principle by which steers are castrated. Without the option of expending bodily resources on sexual reproduction, the organism grows larger. Some gardeners, citing "plant integrity" concerns, don't pick off their garlic flowers. I want big bulbs, so I pick the flowers. And then I happily eat them. Some farmers are savvy enough to realize that garlic flowers are not only delicious, but they're an extra something that you can harvest and sell when pickings are often slim. But these garlic growers are in the minority. Most commercially grown garlic, the kind you're likely to buy at the store, is of the non-flowering type, called softneck, while the flowering types are called hardnecks. Your best bet for tracking down some hardneck flowers is the farmers markets from now until mid-June, or fancy grocery stores. When the flowers emerge depends on the variety of hardneck and climate where it's grown. Once they appear, the stalks grow quickly, curling around like cartoon pig tails until two full curls are completed. After a week or two the stalks then uncurl and stand straight up. With the stalk fully extended the bud finally opens into a spectacular flower. For both culinary and agricultural purposes, you want to pick the stalks no later than the curled state, so the bulbs grow big, and because as the stalks straighten out they lose their tenderness and become woody. But for aesthetic purposes it's nice to leave the flowers on a few of the plants. The bulbs on the non-castrated plants will be smaller, but you get to look at the flowers. I harvest garlic flowers by grabbing the stalk as low as I can, right where it emerges, and pulling straight up with a smooth gentle tug, like pulling a blade of grass. To cook them, cut off the flower's dry tip, and the rest -- stalk and flower -- is edible. You can do anything with scapes that you would do with regular garlic, like chop or press them into your food to add garlic flavor. Or cook them whole, like asparagus or beans, and serve drizzled in lemon butter aside your proteins. Add garlic flowers to a pot of simmering chicken soup, two minutes before serving, and watch the neon green coils curve around the serving bowl. Chop them up small and fry in oil, and then pour in beaten egg for garlic flower scrambled eggs. Or cook them Chinese style, stir-fried with bacon and oyster sauce, like they do on the trains in China. Oyster sauce (1/4 cup per person) Note: Choose the brand with the fewest ingredients. Cut pork into domino-sized chunks, and fry on medium heat. Add oil if the pork is too lean. While the pork cooks, cut garlic flowers into inch-long segments. When all the water has been released from the meat and evaporated off, and the pork is splattering its way to crispy, add the cut garlic flowers, red chili flakes and basil leaves. Stir-fry until the garlic flowers are cooked, adding water or white wine to the pan if it starts to dry out. Add black pepper and oyster sauce. Stir it around for long enough to coat and mix evenly. Adjust chili, black pepper, and oyster sauce to taste. Then kill the heat and serve with rice.